Inspired by John Jacob Niles's many-stringed dulcimer, it's the first one I put internal drone strings in — once I decided that so many on top hampered playing. Being retrofits, the sympathetics don't vibrate well but they help keep the neck straight, under the principle of tensegrity. The bridge is bone carefully contoured to make the strings buzz like those of a sitar. Frets are inlaid bone. The electric pickup was added later, as with all my acoustic dulcimers. 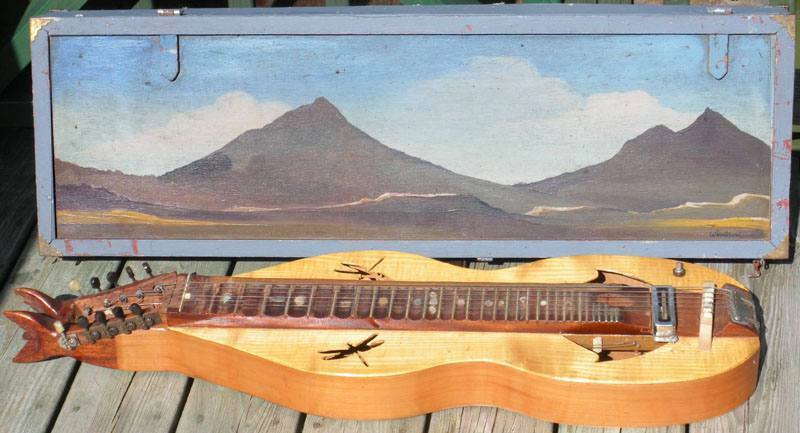 First dulcimer heard on the clip of “Celebration of Fire”, and the lead dulcimer on Juniper Springs. Box painting by Patricia Windrow.